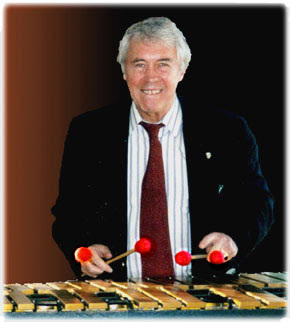 Treat yourself to an exciting and uplifting musical experience at " Jazz Tuesdays" when vibraphone master Warren Chiasson returns with his Trio featuring Warren Chiasson (vibes & piano), Ed MacEachen (guitar) and Ralph Hamperian (bass) on Tuesday, January 31. The Trio will present “A Tribute to George Shearing” in the John Birks Gillespie Auditorium at the New York City Bahá'í Center, located at 53 East 11th Street (between University Place & Broadway). There will be two shows at 8:00 and 9:30 p.m.
Warren Chiasson has been called "one of the six top vibraphonists of the last half century" by the New York Times and a “musician’s musician” by Jazzbeat. Originally a member of the George Shearing Quintet, he has emerged as his own man with a distinctive four-mallet technique that he weaves into a percussive, melodic style. Prior to forming his own group, Chiasson was for many years best known for his creative contributions to the Chet Baker Quartet, the Tal Farlow Trio, and jazz-pop diva Roberta Flack . In addition to recording his own albums, he has played on over 100 recordings with such artists as Eric Dolphy, Bill Dixon, Hank Crawford and was featured on a Grammy Award winning album with B.B. King. Chiasson has collaborated with some of the finest musicians in jazz including Paul Bley, Ron Carter, Roland Hanna and the late Jimmy Garrison from the original John Coltrane Quintet. In the late ‘60s and early ‘70s, the Warren Chiasson/Jimmy Garrison Duo played regularly at Gregory's in New York City, while Chiasson also hosted a weekly jam session at the Signs of the Zodiac in Harlem. Regulars guests included Charlie Haden, Lee Konitz, Joe Farrell, Wilbur Ware and Joe Chambers. His own albums include "Quartessence", " Good Vibes for Kurt Weill " (which was selected as a Billboard Pick of the Week), and "Point Counterpoint" with guitarist Chuck Wayne. He is particularly known for his elegant and often electrifying live performances, as evidenced by the 50th anniversary re-creation of the historic 1938 Benny Goodman concert. When Lionel Hampton was unable to appear due to a previous touring commitment, Chiasson was asked to take his place at Carnegie Hall. The result was a standing ovation performance before this knowledgeable, sold-out audience. Luminaries at this event included Isaac Stern, Doc Cheatham, Panama Francis, and Benny Goodman's daughter, who presented Goodman's clarinet to the hall museum. Admission is 15.00, $10.00 for students. Tickets will be sold at the door, or call 212-222-5159 for reservations and information. The John Birks Gillespie Auditorium, dedicated to the late jazz great Dizzy Gillespie, who was a Bahá'í, is located in the heart of Greenwich Village, within the New York City Bahá'í Center. Beginning on January 6, 2004, the anniversary of Dizzy’s death, his former pianist and musical director, Mike Longo, began presenting weekly jazz concerts every Tuesday evening at 8:00 and 9:30 PM. Diana Krall: "Summer Nights Tour 2012"
CD of the Day - "Clare Fischer: Latin Patterns"
CD of the Week - "Regra de Três: III"
Jill Biden: "Sign Michelle's card"
Vinyl of the Day - "The Percussive Phil Kraus"
CD of the Week - "Lupa Santiago Sexteto"
Celebrating Erin Mia's Birthday, tonight! DVD of the Month - "Stan Getz: Live at Montreux"
Vocal CD Reissue of the Month - "João Gilberto"
Vinyl Box Set of the Month - "CTI Vinyl Bundle"